Great service from Janelle! I will definitely contact again! All Centric Parts premium brake components are engineered and manufactured using stringent, well-proven production processes. Centric's global suppliers have already passed these stringent quality assurance standards because they currently supply products to OE manufacturers. Centric Parts' in-house engineering department analyzes each part to ensure proper performance and fitment for every application (import and domestic). This attention to detail guarantees that Centric parts will perform as good as or better than the factory original. Centric Premium Plain 120 Series Rotors feature an Electrocoating (E-coating) finish that provides long lasting corrosion protection. Unlike phosphate finishes that provide only minimal protection from the elements, E-coating is a superior electrostatically applied finish designed to withstand 400 hours of salt water exposure without rusting. 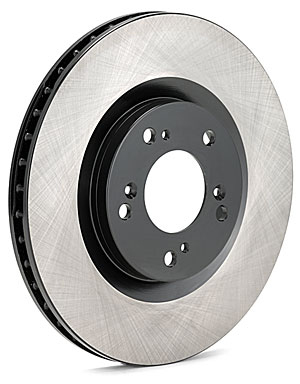 Centric Premium Plain 120 Series Rotors are double disc ground with a taper-free finish. Double disc grinding ensures parallelism, eliminates run out and provides near perfect disc thickness variation (DTV). Double disc grinding leaves a non-directional finish on the friction surface area for more effective pad-rotor break in. Centric Premium Plain 120 Series Rotors are mill-balanced to a tolerance of less than 2 oz. per inch. This additional machining operation reduces the feedback associated with rotor vibration and provides a smooth, confident application of braking force.